For all it’s desire to show the gritty underbelly of London, A Street Cat Named Bob has a certain Hollywood gloss to it which makes it seem to be taking place in that same weird fictional London that Bridget Jones lives in. As a result it is very entertaining but provides a sense (fairly or not) of being heavily fictionalised from the true story of how homeless heroin-addict on the methadone programme, James Bowen, had his life saved by a ginger cat called Bob. Based on the internationally best-selling memoir, A Street Cat Named Bob even co-stars the original cat playing himself (presumably doing the “hero” shots, as several other ginger toms are also credited in the role). It tells the tale of how Bob unexpectedly arrives one day in James’s life and for the first time gives him a focus and something to care for – a reason to carry on living, and to try and get better. While busking James discovers people are coming to see his feline companion and very soon the cat is the star of the show and his notoriety on social media grows. The movie is intentionally heartwarming, in a sort of cosy Christmas movie kind of way (Christmas does, handily, feature quite heavily). And that’s totally fine, if a little unexpected as there aren’t many heartwarming cosy Christmas movies which feature heroin overdoses and addicts glugging their daily dose of methadone at the counter of a chemist. It’s unusual to say the least. But it does have one particularly winning factor in the shape of the star ginger cat. Much as the real life feline was a life saver to the real life James Bowen, so the version depicted in the film breathes life into what could’ve been a fairly grim tale. Apart from anything else Bob the cat injects (pardon the pun) a large amount of humour into the movie, and does so unapologetically. He’s a cat, he simply doesn’t care. 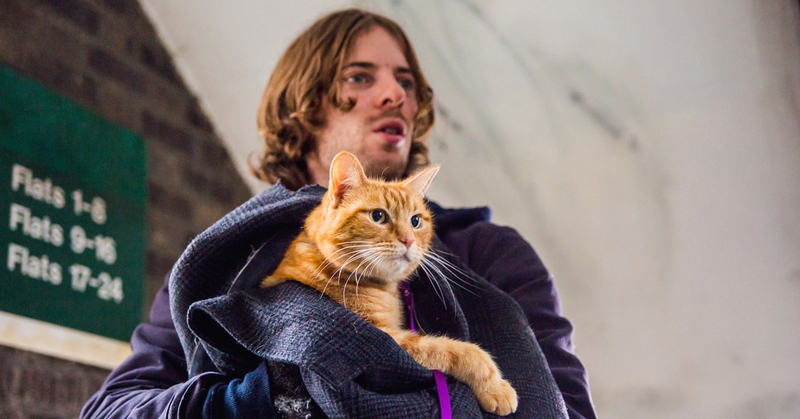 Luke Treadaway is James, and considering for a great deal of the film he is acting alongside a silent cat, does a particularly good job. His calm and silently accepting stoicism is an unusual quality in a narrative hero – he doesn’t really drive the story, but he’s great at reacting to it. And as James undergoes cold-turkey the audience feels the flu symptoms with him. Ruta Gedmintas as near neighbour Belle does a great job of making an wacky seeming hippy character appear likeable and not infuriating. Anthony Head as James’s father and Joanne Froggatt as his doctor also do good work. For all the air of cosiness there is still trepidation and danger. Scenes of robbery, going cold-turkey, fights, all make for threat of things not working out. We know the story ends well as the book gets written, and there is a vaguely meta sense to the narrative too – as we see the book the film was based on being written, published and James’s life being turned around. And it’d be entirely reasonable of you to assume that this feelgood Christmas movie has a happy ending. So for something that could be incredibly bleak, and despite it sometimes seeming to be shot in a fantasy Richard Curtis style fictional London, A Street Cat Named Bob is unashamedly feelgood and wears its heartwarming nature not only on its sleeve, but also in a knitted bow around its collar. A Street Cat Named Bob is out now, and is so cheerfully optimistic it almost feels old fashioned.